Yesterday morning in my post, Beyond Beautiful, I told you about a white arch I saw at sunrise, in the western sky. 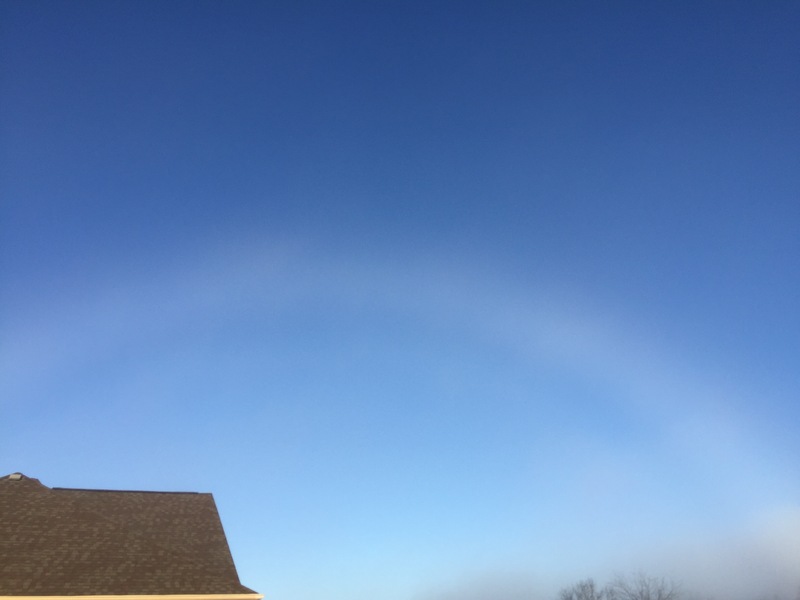 My husband mentioned that it might be called an ice halo. I looked it up and from what I saw, ice halos are circles around the moon or sun. That left me pretty curious as to what I had seen, so I started researching. This is what I found: fog bows. Apparently, they are similar to rainbows, but because the water droplets are a lot smaller than raindrops, the smaller drops don’t catch the sunlight quite the same way and can cause them to appear white. No wonder it felt like Christmas morning that day! In our seven and a half years of living here, we’ve had our share of fog. 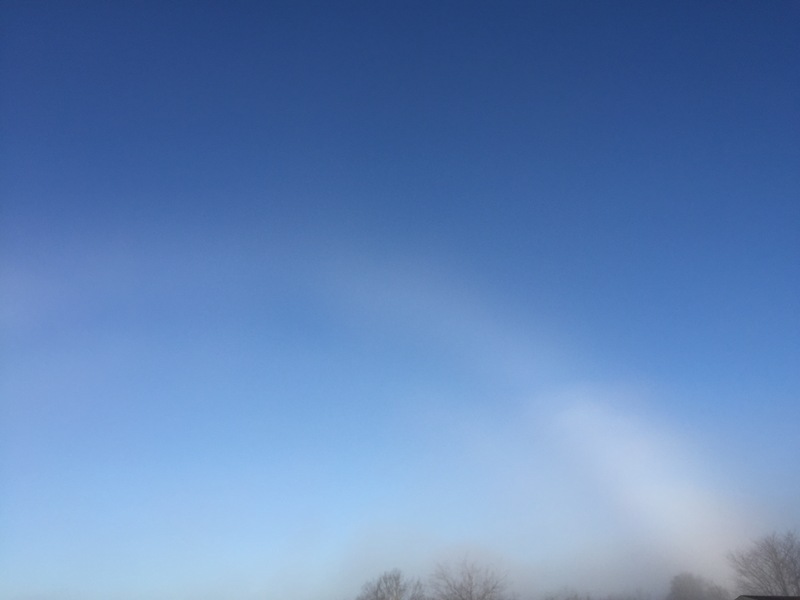 But, a fog bow? Talk about a gift! It was sooooo beautiful. I’ve never seen anything like it. Awesome! I saw that they can be over the ocean or even near a mountain. Bet it was pretty. We live in a river bottom and get some pretty heavy fog. Seeing it sure was a treat. Hi Miri! Oooooh how I’ve been missing you!! ❤️ I’ve been thinking of you, wondering how you are. You wrote about it? I didn’t see that. Doubles are soooo gorgeous. I’m glad to hear that one cheered you. Hugs back! Wow. I just saw that I’m 3 posts behind? I’ve only seen one in my reader. I just thought you hadn’t been posting. Now that is something cool to add to a bucket list! I love what you said about well kept secrets. I also saw that there are Moonbows, also known as lunar rainbows. They are reflected with the moon’s light instead of the sun’s. Wouldn’t it be neat to see one of those? Yes!!! Oh my goodness… I am going to google them right now! haha. That’s the cooolest thing! Just the name alone would want me to look into it further. Glad you shared with us info and these wonderful photos. I’ve seen that! It’s called Vodka Fog! Oh wait, that was yesterday…never mind! Weird Guy With The Dog……that’s too funny!! Ooo! I hope you see one behind a church!! Hope you have a beautiful day, too! Love and kisses from me and LB! 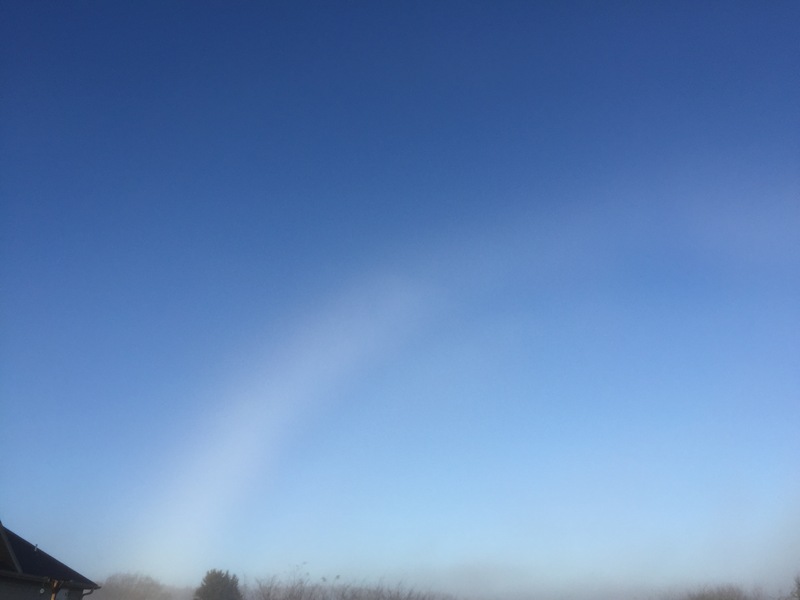 I’ve never heard of a fog bow before! I’ll have to keep a look out for them on our walks! Oh. I hope you see one! They are soooo wonderful! If I do, I’ll try and get a pic to post! Thank you! I have never seen one and never even heard of one-Look at you-out there always looking for beauty, and therefore always finding. A fog bow find, ought to mean something good! YOU, my friend, brought a huge smile to my face. (Again!) Love what you said. Especially the looking and finding part! ❤️ I’m so thankful I walked out the door that morning and for cameras! Some things need to be shared. I’d never heard of them either. They are pretty darn cool. Maybe you’ll see one at the rabbit patch. Fingers crossed!